WILLIAM ALLEGREZZA edits the e-zine Moria and the press Cracked Slab Books. He has published five books, In the Weaver’s Valley, Ladders in July, Fragile Replacements, Collective Instant, and Covering Over; one anthology, The City Visible: Chicago Poetry for the New Century; seven chapbooks, including Sonoluminescence (co-written with Simone Muench) and Filament Sense (Ypolita Press); and many poetry reviews, articles, and poems. He curates series A, a reading series in Chicago dedicated to experimental writing. In addition, he occasionally posts his thoughts at http://allegrezza.blogspot.com. 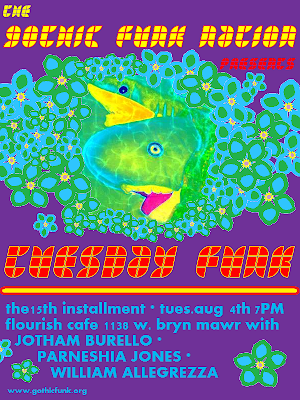 JOTHAM BURRELLO is an adjunct faculty member at Columbia College Chicago where he directs the publishing lab, a resource for emerging writers. His writing has appeared in Eleven Eleven, Drunken Boat, Oyez Review, Pennsylvania English, the Christian Science Monitor and elsewhere. He recently completed his novel, Fall River. He’s a former editor of the journal Sport Literate. His multimedia company, Elephant Rock Productions published the anthology All Hands On, The 2nd Hand Reader, and produced instructional DVDs for writers featuring Janet Burroway, Robert Olen Butler, Joe Meno, Rosellen Brown and others. He lives in Chicago with his wife and two little boys. Recipient of the Gwendolyn Brooks Poetry Award and the Margaret Walker Short Story Award, PARNESHIA JONES is published in several anthologies including The Ringing Ear: Black Poets Lean South and America! What’s My Name? The Other Poets Unfurl the Flag. She has been featured on Chicago Public Radio – Chicago Amplified and has performed her work all over the United States including the Nuyorican Poets Café in New York City and the Art Institute in Chicago. Jones was commissioned by Art for Humanity, and the city of Chicago, to write poetry, for an exhibition, that will be unveiled in Durban, South Africa during the 2010 World Cup. Parneshia is a member of the Affrilachian Poets, a collective of voices that bridge Africa and Appalachia, and is on the board of the Guild Complex and Uni-Verse of Poetry: A United Nations of Poetry. She is the head of sales and international rights for Northwestern University Press, holds a M.F.A from Spalding University in Louisville, Kentucky, and has completed her first collection of poems, Waiting for Hurricanes, and is currently working on a trilogy collection of persona poetry. KRISTIN FITZSIMMONS received her MA from the University of Chicago in 2008. She is currently an Americorps member at the Hull House Association in Uptown where she teaches English as a Second Language and attempts to learn Spanish as a fourth language in addition to French and Dutch. Some of her recent poems are published in the March/April 2009 edition of The Boston Review. CATHY GILBERT grew up in Central Illinois, and after receiving her MA in the Humanities from the University of Chicago, she returned to that area to become an Instructor of English at Heartland Community College in Normal, IL. She teaches many levels of composition and is excited to teach some creative writing classes in the fall. When she is not frantically planning, teaching, or grading, Cathy turns to poetry to calm her nerves. Her poems have appeared in the Madison Review, Main Channel Voices, and Pank, and can most recently be found in an online journal called r.kv.r.y. Cathy is very grateful for the opportunity to read her poems tonight, here in the great city of Chicago. She’s been looking forward to the promised cupcake for over a month. BRYAN ALASPA Bryan Alaspa has been writing in one form or another since he first sat down in front of his mother’s electric typewriter in the third grade. At that time he typed out his first three-page, punctuation-deprived piece of fiction. It has been downhill ever since. Despite a brief detour into the world of broadcasting via radio, Bryan has been passionate about writing from that day forward. Bryan wrote his first full-length novel, The Ballad of the Blue Denim Gang, just after college. Right after that he wrote a mystery novel, The Vanished Child. He took a break, writing mostly articles and business-related materials before returning to fiction with his powerful and disturbing look at small town life called Dust. 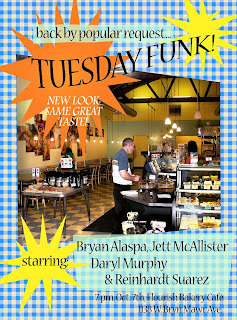 Bryan has also recently ventured into non-fiction thanks to Schiffer Publishing. His book Ghosts of St. Louis: the Lemp Mansion and Other Eerie Tales was released in 2007. He has since written the book Chicago Crime Stories: Rich Gone Wrong which will be released in spring of 2009. He has a book about famous Chicago disasters in the works for Schiffer as well. RIG is his first foray into the genre that made Bryan want to start writing in the first place: horror fiction. While he wrote the book shortly after Dust, it took him time to rewrite and fine-tune the story for publication. Bryan still lives in Chicago and is working on both fiction and non-fiction works while also writing articles, columns and reviews for various print and online publications. He still hopes to some day write the definitive book on Chicago. JETT McALLISTER received an MFA in poetry writing from the University of Virginia, where he was a Henry Hoyns Fellow and served as the editor of the journal Meridian. He is currently writing a dissertation on sublimity and contemporary poetry at the University of Chicago. His poems have recently appeared in the Columbia Poetry Review, Center, Hunger Mountain, Bitter Oleander, and other journals. DARYL MURPHY received an MFA from the University of Iowa’s Writers Workshop and has published poetry and fiction in journals including The Black Scholar, Passages North, and The MacGuffin. Daryl has been creative writing faculty at various colleges and universities since 1985. REINHARDT SUAREZ wonders why the king sent all his horses to help put Humpty Dumpty together after his unfortunate fall off the wall. This is principally due to two things: the common horse’s animal intellect (which is woefully inadequate for the complex surgical work involved) combined with a distinct lack of oposable thumbs. Reinhardt Suarez, on the other hand, does not lack opposable thumbs. He has used his thumbs–along with his other fingers–to write his recently completed novel, Guessing and Keeping Still, as well as other sundry tales of derring-do. He lives in Chicago, where several other people live, too. Poet and artist KRISTY BOWEN the fever almanac (Ghost Road Press, 2006) as well as several chapbook projects, including feign(NMP, 2007) and at the hotel andromeda, a collaborative book arts project inspired by Joseph Cornell. Her second collection, in the bird museum is forthcoming from Dusie Books this summer. Another, girl show, will be published by Ghost Road Press in 2009. She edits the online litzine wicked alice and runs dancing girl press & studio, which publishes work by women poets, hosts readings, retreats and workshops, and features a variety of paper and ephemera related arts and crafts. Visit: kristybowen.net. ROY GUZMAN was raised from the depths of Honduras and relocated to the saunas of Miami, Florida. Holding degrees from the University of Chicago and Miami Dade College, Roy is an avid comic book and music collector, sometimes skipping two meals to save for another CD from those late-80s bands (O, why did they have to break up?). He fancies asking for help — especially when he does not need it — and his childhood hero is Cornelius Rooster. CARL MARCUM received his MFA from the University of Arizona. He has held a Wallace Stegner Fellowship from Stanford University, and received grants from the National Endowment for the Arts and the Illinois Arts Council. His first collection of poems, “Cue Lazarus,” was published in 2001. A new collection, “Constellation,” is forthcoming. He is a Visiting Assistant Professor at DePaul University in Chicago where he teaches creative writing and literature. 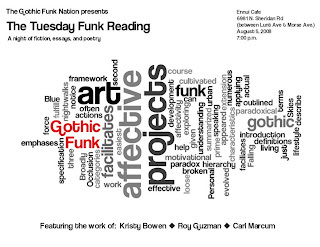 The Gothic Funk Nation is a collective of artists, adventurers, writers, party-ers and idea-ists. Writers! Musicians! Artists! Deadline extended for the Paramanu Pentaquark arts journal! Help Support the Hopleaf and Peirce Elementary School! Tweets that mention CC. GF response to the crisis in Haiti: -- Topsy.com on Response to the Crisis in Haiti.